Martha White cornbread with ground beef or sausage, corn, vegetables, and cheese make up this filling skillet meal. Happy Thursday everyone! It's that time of year again for all things cornbread and cast iron! Why cornbread you ask? Well April is when the 19th Annual National Cornbread Festival takes place in South Pittsburg, Tennessee! This year the cornbread festival will be on April 25th - 26th! I was invited to be a judge for the cook off competition, but my schedule got the best of me. It saddens me that I have to miss this huge event, but there's always next year. The 2015 National Cornbread Cook Off will be a bit different for this years competition. Ten of their First Place Winners from past years will be returning to the cornbread festival to defend their title, prepare their winning recipe, and take part in an All-Star-Cook Off! Here's a list of all the previous winners and everyone that will be competing. I can't wait to see who will be crowned the cornbread winner! Today's recipe that I'm sharing is a tasty one. This recipe is one of my absolute favorite recipes that my Mother in law makes. 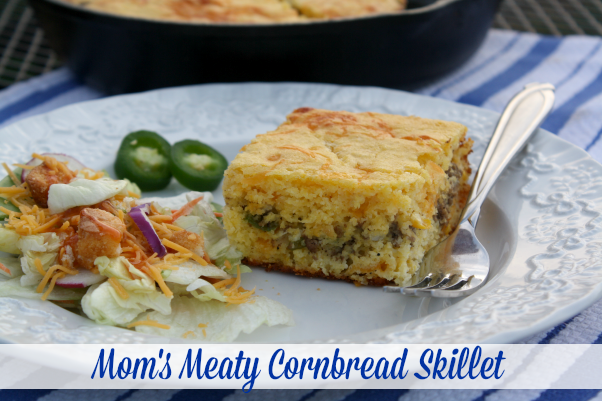 Anytime we visit we can usually count on meatloaf, chicken spaghetti or this Meaty Cornbread Skillet for dinner. Moms always makes her cornbread homemade all the way, but sometimes I like substituting with a cornbread mix, especially if I'm in a pinch for time. Martha Whites cornbread mixes taste just like homemade, so no one will ever know not even mom! To kick off the Cornbread Festival Martha White® is hosting a Virtual Cornbread Potluck along with myself and a few of my favorite blogs. We were asked to bring our best ever cornbread recipe that utilizes Martha Whites Cornbread Mixes. 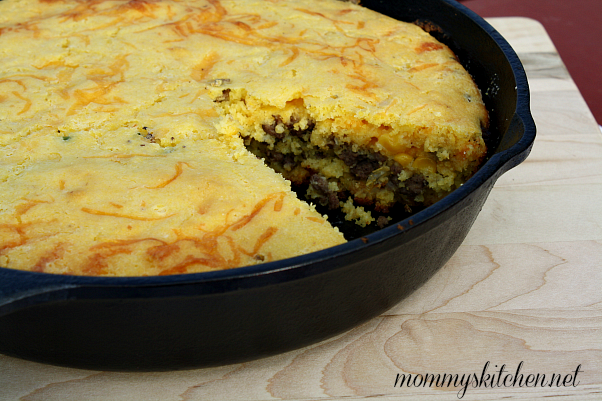 My Moms Meaty Cornbread Skillet is the recipe that came to mind as well as the one that I'm contributing. So everyone pull up a chair, find a place at the table and enjoy the potluck! 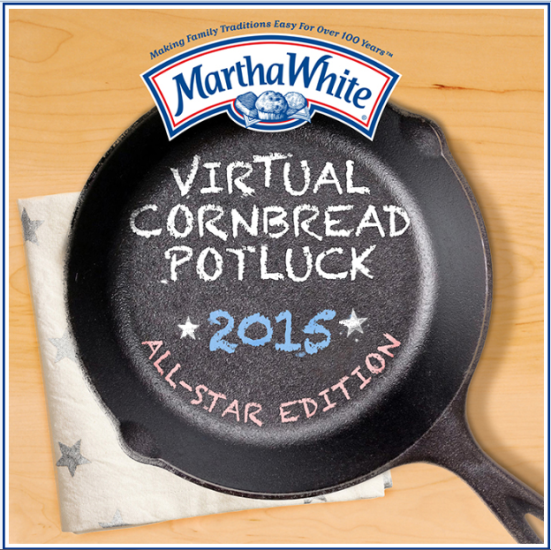 Below is a list of bloggers who are participating in the 2015 Virtual Cornbread Potluck and their recipes. Please take a moment and stop by each of their sites and check out their cornbread creations. Before I forget there just might be a little giveaway at the end of this post! 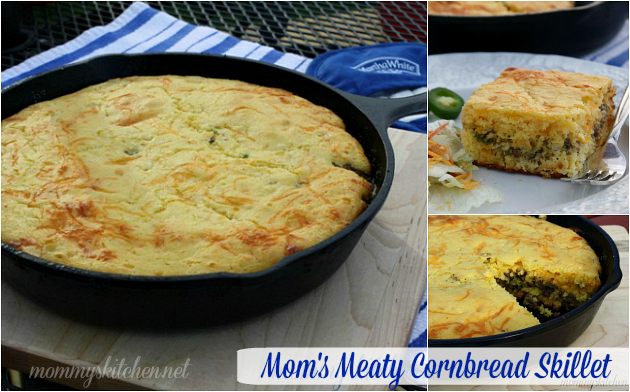 Lets get started with the step by step directions on how to make this meaty cornbread skillet. In a large skillet brown the ground beef or breakfast sausage, onion, garlic, and diced jalapeno peppers. Drain off any excess grease from skillet. Season with salt and pepper and set aside. In a large bowl mix the corn bread mix according to package instructions (substituting buttermilk for milk and adding the beaten eggs). Add the cream corn and one cup of shredded cheese. Mix to combine and set aside. Preheat oven to 350 degrees. Add one tablespoon of bacon grease to a large cast iron skillet (mine measures 11 inches). Place the skillet into the hot oven until the bacon grease melts and the skillet is nice and hot. Remove skillet and sprinkle enough corn meal to lightly cover the bottom of the skillet (this gives the cornbread a crispy bottom). You know it's hot enough when the corn meal sizzles. Pour half of the cornbread batter into the pan. Add the meat mixture and the remaining 1 1/2 cups of shredded cheese. Pour the remaining cornbread batter over the meat. Place the skillet in a 350 degree oven and bake for 30 - 35 minutes or until the cornbread is lightly brown on top and cooked through. Test with a toothpick by inserting into the cornbread if it comes out clean it's done. Cool in skillet about 10 - 15 minutes before turning the cornbread onto a serving plate. Slice and enjoy. Serve with a salad to complete the meal. In a large skillet brown the ground beef or breakfast sausage, onion, garlic, and diced jalapeno peppers. Drain off any excess grease from skillet. Season with salt and pepper and set aside. In a large bowl mix the corn bread mix according to package instructions (substituting buttermilk for milk and adding the beaten eggs). Add the cream corn and one cup of shredded cheese. Mix to combine and set aside. Preheat oven to 350 degrees. Add one tablespoon of bacon grease to a large cast iron skillet (mine measures 11 inches). Place the skillet into the hot oven until the bacon grease melts and the skillet is nice and hot. Remove skillet and sprinkle enough corn meal to lightly cover the bottom of the skillet (this gives the cornbread a crispy bottom). You know it's hot enough when the corn meal sizzles. Pour half of the cornbread batter into the pan. Add the meat mixture and the remaining 1 1/2 cups of shredded cheese. Pour the remaining cornbread batter over the meat. Place the skillet in a 350 degree oven and bake for 30 - 35 minutes or until the cornbread is lightly brown on top and cooked through. Test with a toothpick by inserting into the cornbread if it comes out clean it's done. Let cool, turn cornbread onto a serving plate, slice, and enjoy! Cook's Note: I make this recipe with either ground beef or breakfast sausage. Trust me this dish is awesome either way. Last but not least! 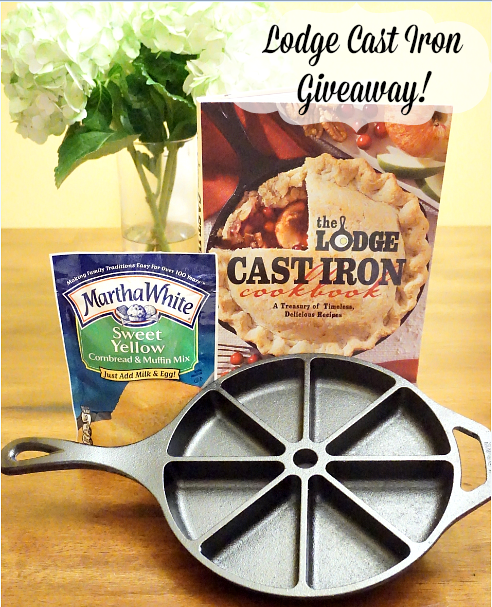 The nice folks at Martha White and Lodge Cast Iron are hosting a giveaways! One lucky Mommy's Kitchen reader will win a "Cornbread Prize Package" See below for details on how to enter. This Giveaway is now CLOSED! Thank you to all that entered. Click the Tweet button below and tweet this giveaway for a bonus entry. (Come back and leave a separate comment for your tweet). The giveaway starts Thursday, April 9th 2015 and closes on Wednesday, April 15th 2015 at midnight (CST). A random winner will be chosen and the winner will be contacted via email. The winner will have 48 hours to reply and claim their prize. If you comment anonymously please include your email address in the event that you're a winner. Giveaway is open to US Residents only due to shipping charges. Disclosure: This post is sponsored on behalf of Martha White. I was provided with a gift card for the products purchased to make this recipe and for my time and efforts in creating this post. All opinions are my own. Very nice you can't go wrong with those ingredients! i prefer poblanos, a bit of salsa and a wee bit of corn, just for texture. What a wonderful weeknight meal! I like my cornbread slightly sweet with LOTS of butter! I like my cornbread a bit on the sweet side. I love my cornbread sweet with lots of butter. But I grew up eating unsweetened traditional cornbread and enjoy that occasionally also. Ok, not commenting to win. LOL. But I just wanted to let you know how good this looks!! I love that it is truly a meal in one. Serve it up with a cold glass of sweet tea - Mmmm. Mmmm!! Will miss ya at the festival!! Love regular cornbread and Mexican cornbread from scratch. Great with soup. We have been to the cornbread festival several years ago. Mattie Howard Alexander City, Al. Sounds like a winner to me. will have to try soon. I love lots of butter and sugar with my cornbread. YUM! This looks super delicious!! A whole meal in one pan! I like sweet cornbread unless it's going in milk, then I prefer just plain ole' cornbread! It doesn't matter to me. I just love cornbread, unless it is dry. I would love to try some of these mexican recipes with cornbread. I like sweet Northern cornbread. I like it toasted with butter. I love cornbread,baked in the oven in an iron frying pan,with or without the meat.Thin cornbread made of cormeal,salt and water backed until crisy all the way thru. Crackling bread is good also. I always want my cornbread plain - please no sugar! Love the pans that give more crusty sides also. I love my cornbread SWEET!! I also always add a few tablespoons of sugar to every batch of cornbread I make. I cannot wait to make this! I love cornbread; savory, sweet, doesn't matter to me, I could eat it every day in any way shape or form! I love my corn bread made with Martha White Flour pored in to a hotly greased cast iron pan. Baked till crisp around the edges, then slathered with honey and butter. Most assuredly drool worthy. Bon appetit. I like both sweet and regular cornbread! I love this recipe! An old friend of mine used to make it and I've looked for a recipe I like! Thanks! I love cornbread any way I can get it! Reminds me of my childhood. I usually like my cornbread plain, not sweet but its ok if I smear honey butter on it! I loved mine fried. Some people call it hoe cakes. 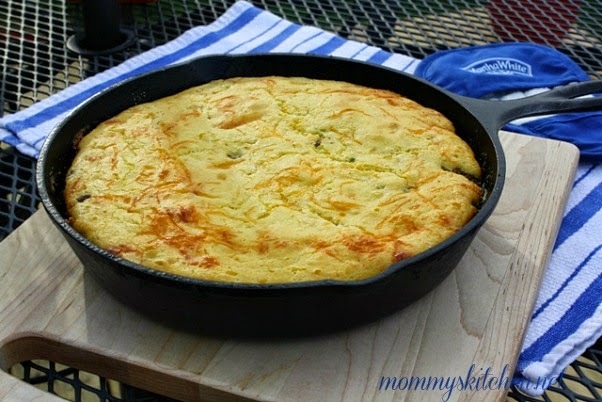 I love plain cornbread cooked in an iron skillet until it is crispy!! YUM!! I love sweet cornbread. I cook mine with cream corn too. I love both plain and sweet cornbread.This recipe looks delicious. I have copied it and I am going to make it tonight for supper. I love cornbread both ways sweet or not sweet! But prefer slightly sweet with butter and or honey! I like my cornbread sweet. My husband with peppers and cheese. I remember when I was little my mom would pour coffee(cream & sugar added) on leftover cornbread the next morning. MMMMMMMM I might have to make some cornbread tonight. The best cornbread is just plain ole' southern buttermilk cornbread - no sugar allowed and of course, it must be cooked in an iron skillet. Just add butter - yum!! I like plain old-fashioned cornbread. The sweet version is too much like cake and who wants cake crumbled in their pintos? I love cornbread so much that I could eat the whole pan! I love some hot, sweet,buttery cornbread anytime! Saweeet! With butter and honey to make it extra sweet. I like my cornbread just plain ole cornbread with lots of butter! I like my cornbread not sweet. I love cornbread either way. Sweet, not sweet. My favorite way to eat leftover cornbread is to put the cornbread in a tall glass, pour milk over it and grab a spoon. My daddy called this "cornbread and sweet milk" as opposed to those who like to pour buttermilk over it. Try it, you'll like it. I like it sweet, with yellow corn meal, crispy brown on the bottom, with melted butter on top! MMM MMM. It will melt in your mouth, that must be what heaven tastes like here on this side of the Jordan! I love a sweet cornbread, but will try a spicy one. I really like it both ways, but especially unsweetened drizzled with syrup for dessert! I like corn bread regular, sweet, hot, spiced up, with creamed corn, w/cheese,with a glass of buttermilk..etc, just about anyway you can make it. I like my cornbread regular with lots of crispy crust and butter. I love Mexican cornbread! Lots on cheese, onion, hot peppers, and cream corn. Add lots of butter on top after cooking. Yummy! I love my corn bread the good old fashioned southern way, yellow corn meal is a must and buttermilk always! I heat up my cast iron skillet (with bacon grease in it or course!) in a 425 oven for about 20 minutes and then I pour my cornbread mixture into that hot sizziling pan that produces the most wonderful crusty crunch outside and the most moist wonderful corn bread inside! Gimme a tub of butter and I am happy! Cornbread is not cornbread unless it is cooked in a. cast iron skillet. It can't be sweet and must have cream corn in it. I like my cornbread sweet. But I did not grow up with a lot of cornbread. I think I would like it many ways. I love my cornbread sweet, crispy on the outside and soft inside, homemade always with butter and maple syrup, with chile on the side or with corn in it. I am from the North so I tend to like it sweet but since living in the South for 18 years, I like it southern style too, in a skillet and crusty on the edges, not sweetened. I just love cornbread. We make cornbread dressing for the holidays and there is nothing else like it for dressing! I really love it with butter! Just about anything---peas, stew, soup! I just love it! I LOVE Martha White's Corn Bread Mix! I like it a little Sweet! A little sugar suits my palet. Growing up in the south, a good skillet baked cornbread, with a plate of fresh veggies and chicken is one of the most comforting traditions I've known. When playing around with different recipes I like adding chopped pecans and bacon pieces. I like my cornbread a little on the sweet side and also savory with some "mix ins"! I love my plain ole fresh cornbread right out of the skillet and into a bowl of sweet milk!!! yummy!!!! I love cornbread, just cornbread the sweet is okay but prefer to put honey and lots of butter on mine if I want it sweet. Unsweet with lots of REAL butter! I grew up eating my Mom's wonderfully delicious plain northern cornbread . We had it with everything. My favorite was the next day with pinto beans, Spring onions and sweet milk. My grandmother, who was from the south and lived next door, made sweet cornbread and I loved it when she made it with white beans served with rice. No matter who baked it, it was always in a well seasoned cast iron skillet. I am very fortunate that I have my grandmother's 80 year old cast iron skillet...the best thing I could ever inherit. Love this cornbread! And it's so easy! What a yummy recipe! I will certainly being making this one. I like buttermilk cornbread, but I also make it sweet, or with other ingredients when I get the notion. Bacon cornbread, or made creamed corn. I was raised on cornbread made with no sugar, so when I was grown and tried cornbread with a little bit of sugar in it, I was hooked. I will however eat it either way! I like just plain ole cornbread. I also love Mexican food and this looks super. Sorry folks but cornbread should not contain sugar! I love cornbread plain or Mexican style! Gotta have cornbread with beans for sure! And a good glass of slightly sweetened tea! Good luck everyone! Plain ole cornbread is my choice. I never had sweet cornbread until I started school, and the cooks served it with ham and beans. It was more like a dessert. I now prefer plain salted cornbread, reserving the sweet kind for a treat. I love cornbread any which way. Love eating cornbread with butter smeared liberally on it while still warm. So delish! I'm not picky, I like it both ways! I just depends on what I'm eating it with. Great recipe as always! I like my cornbread on the sweet side. Great giveaway!! I love cornbread with butter and honey. I love cornbread!!! I could eat it 3 times a day. I love my cornbread plain, not sweet. Poured into a sizzling Lodge skillet with a bit of bacon grease to make the edges nice and crispy. I like to cut a wedge and sink it into a big bowl of vegetable beef soup or bowl of brown beans. I love it in a glass of milk with salt, pepper, and chopped green onion. I love it made into a corncake with a fried egg on top. I love to make cornbread croutons for a delicious salad. I have tried Mexican cornbread and this meaty cornbread you make. Believe me, I could live on cornbread! Wish I had a piece right now. I like sweet cornbread with a nice helping of butter spread on top. Ok...I'm craving a nice warm chunk right now. I like both sweet and plain cornbread. I'm confused about sweet cornbread or not. I've been eating cornbread for 60+ years and it has a small amount of sugar in it. Does that make it sweet cornbread? If so, I like mine sweet! I adore cornbread! I love it with jam & butter!My favorite is to bake honey cornbread! I also love to use it has a topping for casseroles! I PREFER PLAIN OLE WHITE CORNBREAD. I LIKE SWEET "CORNCAKE" MADE WITH YELLOW CORNMEAL. I love plain cornbread, warm out of the oven with a little butter! Linda --- I like my cornbread plain with buttermilk along with it -- My Mother was from Memphis but I was brought up in New York - So I think our family was the only one that liked it plain. Grew up eating corn bread. I prefer the crispy bottom unsweetened. Remember cutting a piece fresh out of the oven and putting it in a glass of milk. (simple delight!) Cast iron is definitely the way for perfect cornbread. These day hot water cornbread is a favorite for a pot of greens. Plain or sweet. As a main meal or as a treat. Having cornbread is always a treat. Come stuffing time it's got to be cornmeal bread stuffing! It can be the main star with a glass of milk ,or on the side, or as a dessert. You can't beat it! I like my cornbread sweet with butter. i always add a pinch of sugar, so its not real sweet.i will be omitting the hot peppers from this recipe.i always bake mine in cast iron. i use all cast iron, have all my life. I guess that I am a real southern girl that takes after her grandfather... I like my cornbread in a glass of buttermilk. I also like it hot out of the oven with homemade butter. I love savory cornbread but cornbread is like a trip back to my mom's table. I love the smell of it cooking and the simple but delicious reminder of my mom. I love both sweet cornbread with a smear of warm butter or savory cornbread with jalapenos and cheese. So yummy either way! This recipe looks so delicious Tina! Sweet "cakelike" cornbread is my favorite. I prefer my cornbread sweet and fluffy, similar to the consistency of cake. Also, love to add meat to my cornbread mix to give it a little flavor. My son's favorite is Bacon Cornbread. I like my cornbread not too sweet, with butter, pinto bean juice on top, in a glass of milk. I've started putting my beef stew on top too. I make a recipe sort of like yours, but I put a can of pintos and some tomatoes mixed in with my hamb. and put my cornbread on top. Yum. I will have to give yours a try. I always cook my cornbread in a cast iron skillet. I love cornbread sweet or plain. Thank you for the recipe, I honestly didn't know you could fix it so many different ways ! I have to try this it looks great ! Sweet from my cast iron skillet ... please keep the milk away! I don't even want to see cornbread in milk. I like mine a little sweet for most of the time but this spicy savory recipe looks great. May have to try it! Plain cornbread with a nice crust! I just like mine either in the bean soup or just plain with butter. I put a pinch of sugar in my cornbread, but I don't like enough of it to taste the sweetness. However, I do sometimes like to sop my hot buttered and cheesed cornbread in Grandma's molasses with butter mashed in with the molasses. I love a sweet cornbread! I love it hot with a ton of butter! Yummo!! Thanks for the links to all the recipes - they all sound great! I always a couple tablespoons powdered sugar to the batter before I bake it. Like it a little sweet. But we usually have a chunk of it with honey butter on it for dessert too! I like cornbread just a bit on the sweet side. Your recipe sounds delicious. Would love to win this set from Martha White. OMG, this looks great! What a great give a way. I love sweet cornbread with lots of butter and honey. Thanks for the chance to win!! Recipe sounds delicious! Can't wait to try it. Yumm! I prefer tne sweetened version either from scratch or a mix. Can't wait to try your recipe with meat. I use Italian sausage in place of regular sausage in recipes so I may try it with this one also. Most of the time I like it sweet and with yellow cornmeal rather than white. I have had corn sticks that were not sweet that were awfully good though! I like my cornbread pretty sweet, and crumbled in a bowl of soup! Well, among other ways...lol. Hi first of all the recipe looks good.I am going to make it for dinner one night.Now I will tell you how I like my corn bread fried in butter. Hey, I tweeted this and also need to add that my favorite cornbread is sweet style. Now, I have to say my favorite way to eat cornbread is warm from the oven, butter and maple syrup. That takes me back to my childhood. Wow. Of course, I like cornbread with chili on top, or with corn and NM chile-peppers in it, and much more. I have a hankering for some skillet cornbread with Cincinnati-style chili w/ all but the soda crackers on it. Any way with cornbread is fine with me. I love my cornbread sweet! We just finished having your recipe for dinner and it was "delish". I like plain cornbread, Mexican cornbread, cornbread with cheese, corn, hamburger, sausage, most anything added, but NOT sweet cornbread! It does have to be cooked in a "black iron skillet". I like my cornbread fried! Yummmo! I actually love all different cornbread. One of my favorite is the sourdough version. Mm mm good! I like my cornbread with jalapenos, corn, and cheese! Always use Martha White Corn Meal and Martha White self rising flour when making my famous cornbread. I say famous because over the years I have demonstrated and given my secrets to many a cook. Have used the same cast iron skillet. No sugar needed. I like to add a little honey to the mix and when it comes out poke holes and slather with butter! I tweeted! Also I shared on Twitter. I love plain cornbread, or with some corn mixed in, crumbled into a bowl of chili! I love my cornbread sweet! My favorite way to have it is the following morning in a bowl broken up with milk and more sugar sprinkled on top! Yummy! I love the idea of using a mix and homemade together for this recipe.I'm going to use spicy pork sausage and serve it with eggs for a brunch. Yum!! I like my cornbread a little sweet, but either way is great. Can't wait to try this recipe. I've heard it said that people in the south like their cornbread unsweetened and that as you move your way up north it gets sweeter until so much sugar has been added that it is "cake". I like my cornbread plain, with butter, with honey, with syrup, with chili, with split pea soup, with ham hocks and beans, at breakfast time, at night, ... I just love cornbread! I love my cornbread without the sugar and the best is crackling cornbread cooked in an iron skillet. I love Jiffy cornbread with butter. My husband like traditional cornbread, he says Jiffy tastes like cake. I like it a little bit sweet, which my dad would hate. As a child, I NEVER had sweetened corn bread. I first had it in a restaurant and am a convert. I love cornbread, sweet, spicy or plain with butter. I like to put honey on it for dessert. This recipe sounds very good, plan on trying it. Do NOT like sweet cornbread! Like it savory. I grew up on plain cornbread,and I love it,but over the years I've learned to love ALL cornbread. I always cook it in a cast iron skillet. I'm lucky to have my Mother's skillets and I guard them with my life,they are seasoned so well. I barely saved them from the dishwasher once,since then it's hands off for everyone! Lo I would love to win,Lodge is the best cast iron you can buy! Warm from the oven with butter! I like my cornbread slightly sweet with lots of butter and sometimes a little peach jam. I, love my cornbread with baked beans and hotdogs. The kids love it!! Count me in? Must have real butter and honey on my cornbread. I like my cornbread in my cast iron skillet! There's no sugar in cornbread. And it must be in a cast iron skillet. I like mine a little sweet with some spice in it! I always pre heat my bacon grease in cast iron. The only way to eat it! I like it a touch sweet but just a touch.